The work is carried out on the premises by ourselves which means we can help you choose a design and wording to suit your individual needs. The choices range from granite, marble, sandstone or slate. We also stock marble statues & can laser etch images onto any memorial, artificial flowers vases and photo plaques are also available. Take a look at our on line catalogue. Many of these memorials are on display in our showroom. Our stock changes regularly to accommodate fresh designs so there are memorials on display in the showroom that do not feature on the website. 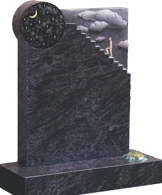 Our prices are very competitive and we always have a "Memorial of the Month". This is a different featured memorial every month offered at a discounted price. Call for more information.